Charles Shcwab got a problem. By filing a lawsuit, he shot himself in the foot. For years he has been providing the township with ‘mapping services’ and now that he put it all out -the township cannot hire him without a bid and his contract expires next month. So, the township goes ahead and tailors a bid that would fit him, and only him. • Charles the cheater is going use the Smartlist to map out all basements. This would take him an hour max. 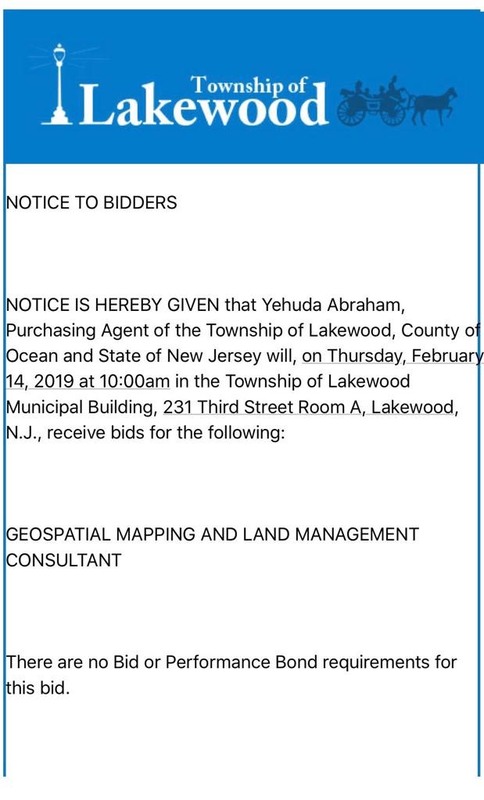 • I wonder how many other towns in NJ need to hire a special consultant for this stuff? • Now anyone will be able to find out who landlord is renting out his illegal basements. This is going to hurt many people. What are the Feds doin by SCK? Some kugel & cholent, might go a long way. His שותפות in Lakeland Bank is a shaila of Ribbis, time to shut him down. This week’s parsha by R’ Dovi Kahan.